Everybody loves the look of the Jaguar Mk5. They have beautiful Art Deco style lines typical of the 1930 – 40s even though they were built between 1948-1951. 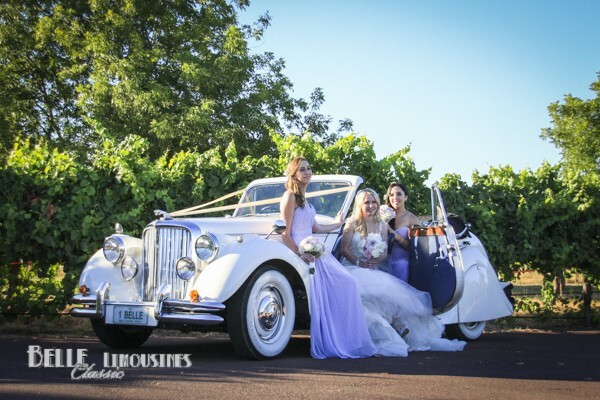 Three things you probably don’t know about the Jaguar Mk5 wedding cars in Perth. 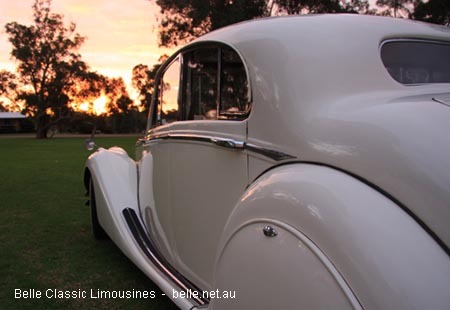 1 Belle Classic limousines re-introduced the Jaguar Mk5s to Perth in 2007 after an absence of many years. 2 Belle have the biggest range of Jaguar Mk5s in Perth including 2 convertibles, 3 sedans and Perth’s only Jaguar Mk5 limousine. 3 Belle Classic have the biggest collection of Jaguar Mk5 spare parts in Perth including spare motors, transmissions – enough spare parts to assemble two more cars. 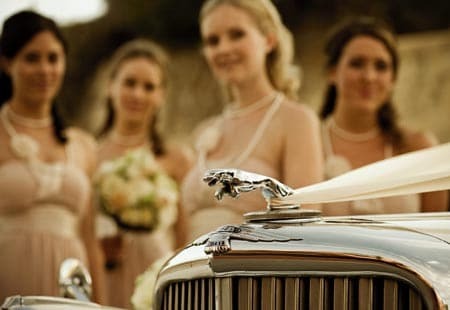 We stand by our Jaguars to be reliable and available on your wedding day. 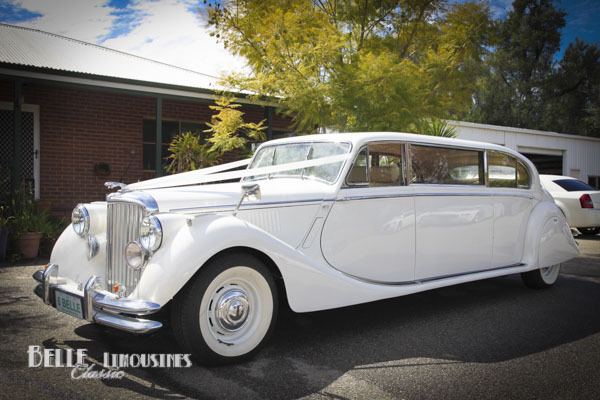 The Jaguar Mk5 is probably the most popular wedding car Australia wide by numbers with between 10 – 20 servicing each capital city. 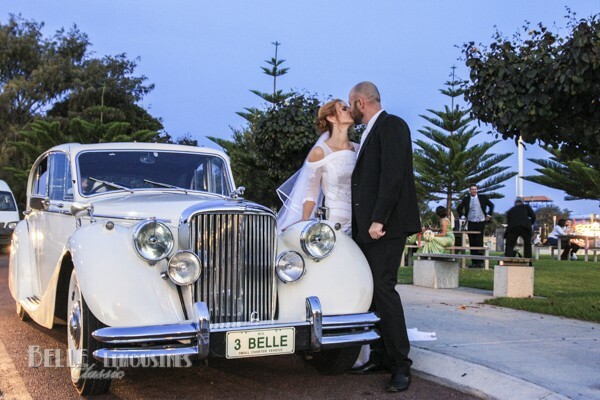 Belle Classic Limousines is proud to have introduced Jaguar Mk5 convertibles, sedans and our limousine to the Perth wedding industry. 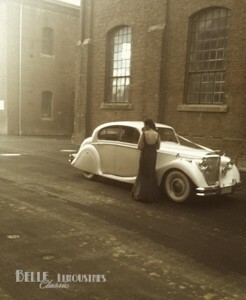 Our Jaguar Mk5s have assisted at 1000s of Perth weddings since 2007. 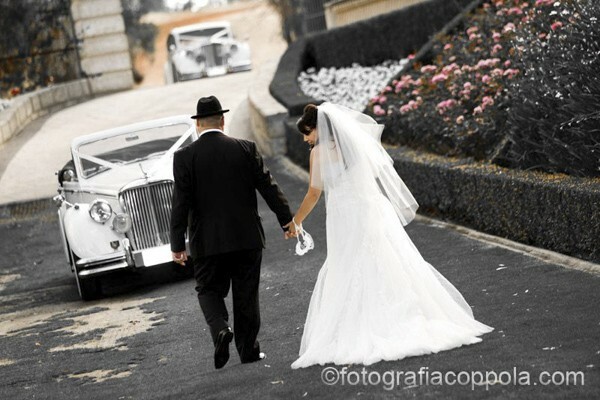 We have an experienced group of friendly chauffeurs who love driving the classic wedding cars. Over the last three years we have attracted the interest of copy-cat businesses but you can be confident that non have the same resources to maintain the roadworthiness of their Jaguars. We stock our own extensive parts store to ensure our cars stay on the road. There is something special about a matched set of Jaguar Mk5 wedding cars arriving at a wedding. Whether you choose a pair of sedans, a convertible and sedan combination or a set of three for a larger wedding party your photographer will enjoy using them as a backdrop for creative wedding photography as much as you’ll enjoy the unique driving experience on the day. The Jaguars are very popular wedding cars and often book out up to a year in advance for Saturday weddings in peak wedding season. 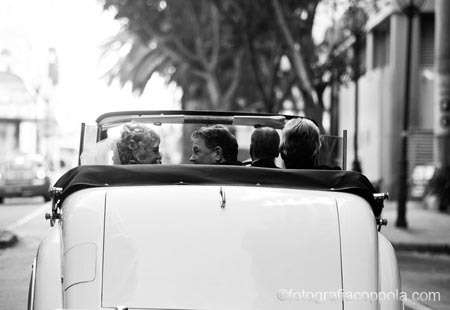 Many couples book their wedding transport just after securing their reception venue. The earlier you research and book your transport for the day the the better selection of wedding cars and limousines you have to choose from. 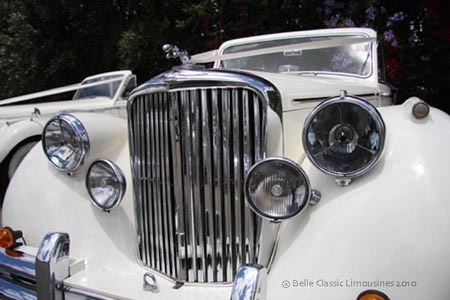 As you may have guessed, our Jaguar Mk5 convertible 1BELLE was the first wedding car purchased to start our business. 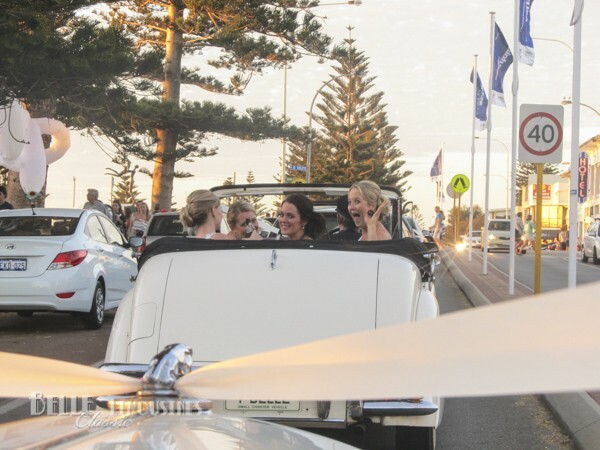 The popularity of the convertibles for wedding photography allowing many creative open roof photo options set a new standard for wedding transport in Perth. The Jaguar convertible is a fun bridal car. Most brides choose to travel to the wedding ceremony with the hood up to preserve their hair. For garden weddings the top is usually put down a few hundred meters before arriving at the ceremony allowing a beautiful entry to the ceremony location which can be captured by the photographers and videographers. At church weddings the top is usually put down during the ceremony so you can have creative photos with the wedding party and family members and capture the bride and groom departing from the ceremony. The top can be put up or down as often as you like on your wedding day, taking only a few minutes each way. 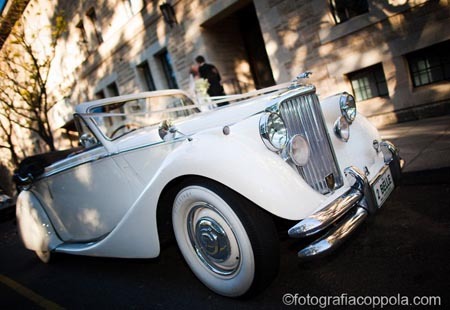 If the open top convertible is not your style the Jaguar sedans provide all the classic styling to your wedding day in air-conditioned comfort. With easy access through the rear doors and a spacious rear cabin the Jaguar sedans have loads of leg room for tall passengers. Depending upon your preferences on the day you can cruise with the sunroof open or closed or use the sunroof for creative wedding photos if you wish. 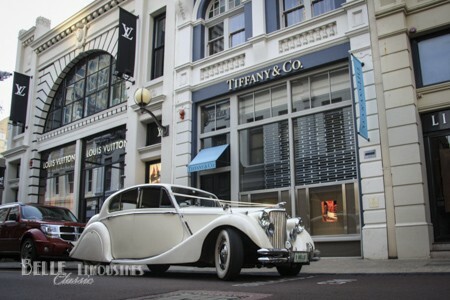 Our Jaguar Mk5 seven passenger limousine completes the set of matching vintage wedding cars. Finished in Old English White (ivory) paintwork with leather interior and walnut burl bars and fittings the limousine retains all of the period features associated with Jaguar. 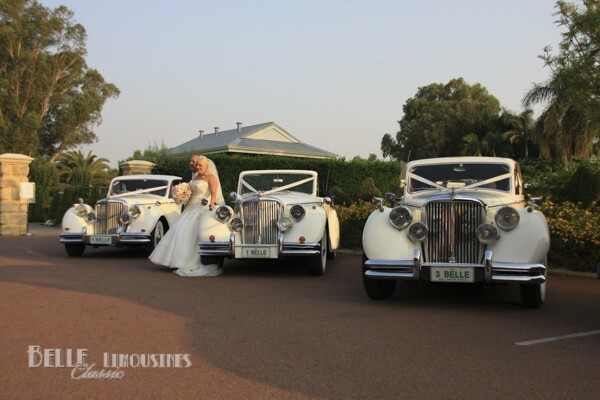 Belle introduced the Jaguar Mk5 wedding cars to the Perth market in 2007. Over the following years we have modified our fleet to be reliable summer proof vehicles with a huge range of spare parts to keep them on the road. In recent years other businesses have copied our fleet but you can be sure that none have the resources to maintain them as well as Belle Classic Limousines. All our Jaguar Mk5 wedding cars are fitted with whitewall tyres to add to the period charm of the vehicles. With the sweeping mudguards and running boards the Jaguar Mk5 styling is reminiscent of vintage cars of the 1930s with the more up-to-date mechanical reliability of modern cars. Jaguar Mk5 convertibles and sedans are four passenger vehicles. We recommend that you restrict that to three passengers if you are using the car for bridal transport to maximise comfort on the day. Having said that many couples do use a convertible or sedan to carry four passengers including the bride, it is up to you. These numbers are based on regular sized passengers, if you have a group containing very tall or stout folks you will need to plan your seating accordingly. When planning transport for your wedding party it is OK to allocate four passengers per car in most situations – you know your group best. Inquiries and bookings for the Jaguar Mk5 wedding cars are best made using the following on-line forms. The Jaguar Mark 5 was the first new model released by Jaguar after World War II. Built from 1948 through to 1951 the Jaguar Mk5 kept the flowing style and running boards of the pre-war cars, but introduced a modern chassis and braking system. It was the platform from which the amazing Jaguar XK120 race cars were introduced in the early 1950’s and the Jaguar Mk7-9 large body saloon cars were built through to 1960. Before the World War II what we now know as Jaguar cars were called SS cars which stood for the Swallow Sidecar Company which branched out into amazing sleek sports cars and saloon cars in the late 1930s. Following the war the company recommenced building the same cars built before the war but had to find a new name because SS was the name of the ferocious Nazi military police and was no longer suitable as a marketing platform. These first cars badged as a Jaguar were later referred to as the Mk4 and are reasonably similar in appearance to the Jaguar Mk5 though they retained the pre-war engineering. The new engine built for the next model of Jaguars including the Jaguar XK120 and the saloon bodied Jaguar Mk7 was far superior to any production engine of the time and quickly led to the car company becoming a world leader in motor racing and sports car production. Despite being a transition vehicle with a short production run, the Jaguar Mk5 introduced several key style markers that became the benchmark for Jaguar sports cars for the next forty years. The famous leaping Jaguar bonnet mascot first appeared as an option on the Jaguar Mk5 and has become synonymous with the brand to this day. The original pouncing Jaguars on the Mk5s is larger and more intricate than the later versions introduced in the mid 1950s and has become an expensive collectible in its own right. The luxury walnut burl timber finishes and trimming in the Jaguars came close to matching that used in Rolls Royce limousines and Bentley sports saloons during the 1950s. The timber dash facia remained a strong design feature for the brand through to recent models. Jaguar sports saloons have always seemed lower to the ground than many other competing cars. The long low roof line on an innovative chassis design allowed the the Jaguar stylists to produce a very large cabin space in a vehicle that appears smaller than it is. This became a major selling point for the brand through to the current models. As simple as it seems when considering modern cars and engineering, the complex curves of the Jaguars made throughout the early 1950s were largely hand made using traditional coach building techniques. The curved rear quarter windows are more remarkable for the body work that houses them – they became the key style feature that defined Jaguar cars through to the late 1990s. The Jaguar Mk5 bumper bars are unique being made from hundreds of pieces that fit together like a jigsaw puzzle. In most cases if one piece is damaged the jigsaw needs to be dismantled and rebuilt to correct the damage. The double ribbed bumper was simplified to a single bar in the Jaguar Mk7 saloons but continued to carry the double ribbed effect through several models through the 1950s and 60s. Fog lamps were a common feature on luxury motor cars produced in misty England from the 1930s through to the end of the 1950s. A few cars like Jaguar included a pair of fog lights as a standard feature. The higher off-set fog lights on the Jaguar Mk5 become a style marker for Jaguar saloon cars through to the late 1990s as dual headlamps of different size and setting.